We met Sam in Los Angeles, last October. Sam, you are doing well organising your studies according with a good surfing place. Nice to meet you again. We met in Quepos at the hostel Rana verde. It was nice to visit the national park Manuel Antonio with you both. Alone I would have probably been to lazy to do this. At late hour I was invited to sleep on a finca which I enjoyed very much. Thank you Ruben for offering me bed and shower. You fulfilled my desire of sleeping on a finca. In Central America this is almost a must do since there are fincas everywhere. 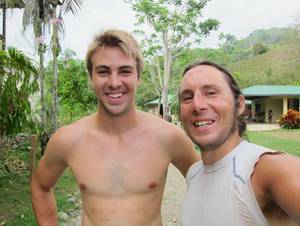 Andy from Colorado is riding his bike to Eastern South America while the less than twenty year young Fin from Victoria B.C. is riding his bike with a surf board in his luggage. This combination requires a special minute of observing :-). We met on Peninsula Nicoya. Stay safe! We knew that the day would come when we would meet. Fabian F�tzel El Durijo and Peter Bronski Earl of Sandwich with whom I studied Mechanical Engineering are doing almost the same trip as I, but in their own bus. In our NW-Assi-Veteran Meeting in Tamarindo we soon found ourselves in nostalgy and there were not few stories to recount. Peter and Fabian started their journey in Halifax, drove until Panama and are going back to the US East Coast. What a great time you gave me, I liked you so much and enjoyed staying with you. Christie and Donny we had met at Stewart, Canada, last August. Christie, I will never forget how we went to observe a nearby bushfire by a four wheeler where I almost got lost in the smoke. Donny, best Canadian boxer ever, took me around to show me his business of making land ready for building. I loved spending time with you, thanks for all the good you did for me.